17.18 5-Bromouracil (a base analog) resembles thymine, except that it has a bromine atom in place of a methyl group on the 5-carbon atom. Because of the similarity in their structures, 5-bromouracil may be incorporated into DNA in place of thymine. Like thymine, 5-bromouracil normally pairs with adenine but, when ionized, it may pair with guanine through wobble. 4 Figure 17.19. Through mispairing, 5-bromouracil may also be incorporated into a newly synthesized DNA strand opposite guanine. In the next round of replication, 5-bro-mouracil may pair with adenine, leading to another transition (G-C:G-5BU:A-5BU:A-T). Another mutagenic chemical is 2-aminopurine (2AP), which is a base analog of adenine (<Figure 17.20). Normally, 2-aminopurine base pairs with thymine, but it may mispair with cytosine, causing a transition mutation (T-A:T-2AP:C-2AP:C-G). Alternatively, 2-amino-purine may be incorporated through mispairing into the newly synthesized DNA opposite cytosine and later pair with thymine, leading to a C-G:C-2AP:T-2AP:T-A transition. Thus, both 5-bromouracil and 2-aminopurine can produce transition mutations. In the laboratory, mutations by base analogs can be reversed by treatment with the same analog or by treatment with a different analog. Alkylating agents Alkylating agents are chemicals that donate alkyl groups. These agents include methyl (CH3) and ethyl (CH3-CH2) groups, which are added to nucleotide bases by some chemicals. For example, ethyl-methanesulfonate (EMS) adds an ethyl group to guanine, producing 6-ethylguanine, which pairs with thymine (see Figure 17.20a). Thus, EMS produces C-G : T-A transitions. EMS is also capable of adding an ethyl group to thymine, producing 4-ethylthymine, which then pairs with guanine, leading to a T-A : C-G transition. Because EMS produces both C-G : T-A and T-A : C-G transitions, mutations produced by EMS can be reversed by additional treatment with EMS. Mustard gas is another alkylating agent. 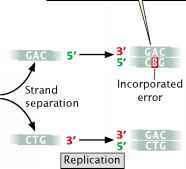 || In replication, 5-bromouracil may become incorporated into DNA in place of thymine, producing an incorporated error. ^ 5-Bromouracil may mispair with guanine in the next round of replication. ^ In the next replication, this guanine nucleotide pairs with cytosine, leading to a permanent mutation.